Naim for Bentley premium audio system (2019 Bentley Continental GT) review | What Hi-Fi? The very best of British in-car audio? Quite possibly. Naim’s sensational in-car system is the icing on this luxurious cake. We open the doors to be greeted by seats covered in the finest leather. Our feet sink into carpet deep enough to envelop a toe. Back massage? Don’t mind if we do. We press the power button, the lights dim and the system springs to life. We’d love to say this is a typical day at What Hi-Fi?, but this test room is a little different. It’s the stunning interior of the Bentley Continental GT, and today’s entertainment comes courtesy of its flagship Naim for Bentley audio system. The latest Bentley Continental GT comes with a choice of three audio systems. A 650W, 10-speaker system with an 11-channel amplifier is fitted as standard. The first optional set-up comes from Bang & Olufsen, appearing in a Bentley for the first time; it has 1500W of power, 16 speakers and a 16-channel amp. But top of the pile is the “Naim for Bentley” premium audio system. This ups the power to 2200W and the speaker count to 18. It includes eight different DSP modes, compared with B&O’s four. 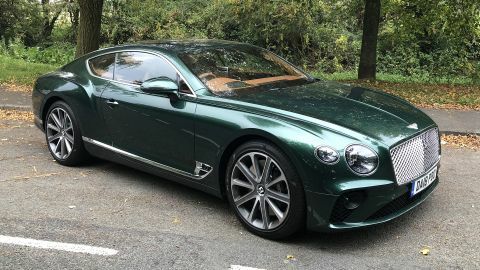 Traditionally, Naim has used a number of BMR (Balanced Mode Radiator) drivers in its Bentley audio systems and the same applies for the new Continental GT. BMRs lend themselves well to a car interior because they cover a wide range of frequencies. The crossover points between these drivers and other speakers can be manipulated and moved to a less sensitive part of the frequency range, which should mean much smoother and more seamless integration. The Naim for Bentley system uses a number of BMRs in the front and rear of the car, including one in the middle of the dashboard, with additional BMRs positioned at either end, in each door and four more in the rear. Other cars in Bentley’s fleet, such as the Bentayga SUV, Flying Spur and Mulsanne, boast more generous proportions, so the fact that Naim has found homes for 18 speakers is all the more impressive. And that’s before you count the two additional Active Bass units bolted to the front seats. The Naim’s basic sound settings are ruled by the ‘tone’ and ‘focus’ submenus, and you need to set them up for each source that you want to use, such as iPod, DAB radio or Bluetooth. The tone menu features Naim’s trademark white-on-black logo and covers four different areas: Active Bass, Subwoofer, Bass and Treble. Each one is assigned a digital dial which can be adjusted using the touchscreen. What’s the difference between Active Bass and bass? The front seats in the Continental GT each have what Naim refers to as a ‘shaker’ unit attached to them. According to Naim, the idea comes from cinemas that use a similar feature to vibrate at certain exciting points in a movie soundtrack. The first version of this technology appeared in the Bentley Bentayga, but Naim claims to have improved the integration and balance of the system here. The Active Bass drivers work between 2Hz and 30Hz. Naim claims the technology is especially useful at lower volumes as it provides the listener with more feel. As the volume goes up and the 15cm subwoofer comes into play, the impact of the active bass is adjusted and reduced accordingly. Initially, we find the rumbles a little disturbing, particularly on tracks with lively bass. Tap the Focus setting and you’re greeted with a long list of the system’s different processing modes. There are eight in total: Naim driver, Naim front, Naim all, Naim rear, Classic, Digital Media, Spoken Word and Enhanced. Each processing mode brings a slightly different take on proceedings, depending on whether you want the most focused soundstage possible or prefer a greater spread of sound and feeling of immersion. There’s so much flexibility, you shouldn’t have a problem finding a setting to suit you. The previous generation Continental GT was launched in 2011 and its infotainment was starting to look and feel dated. The arrival of a new Conti GT sees the whole system get an upgrade. First, you’re treated to the car's party piece. When you first get in, there’s no sign of a display, only wrap-around wood veneer panelling and a line of controls above the central air vents. But all that changes as soon as you press the engine start button. A central section of veneer above the controls flips over, like the license plate on James Bond’s Aston Martin, to reveal a 12.3in high-definition touchscreen. The Bentley Rotating Display costs £4700, but we can’t see anyone leaving this box unticked. A proximity sensor built into the display recognises when your hand is approaching and highlights certain key functions. Tap the display and you hear a subtle but sharp click. It gives the impression of haptic feedback to make it feel as if you’re having a proper interaction. The only downside is that the screen is a fingerprint magnet, which becomes apparent when it's turned off. Some of the key controls such as the scroll wheels on the steering wheel and volume dial have been given that trademark Bentley knurling, which gives them a tactile feel. Besides DAB, AM and FM, the system also supports Apple CarPlay (in some markets) but it’s a shame Android Auto doesn’t get a look-in. Even with the W12 engine burbling under the Bentley’s surface, the car delivers a refined environment for a listening session. Surrounded by leather-clad surfaces, the interior is quite heavily damped and, as you’d probably expect from such a luxury grand tourer, it resists outside noise more than the average automobile. Key to this is the use of laminated acoustic glass, which means you and your soundstage enjoy the benefit. We start with some hip-hop in the shape of Kodak Black’s Patty Cake. It’s a track with no shortage of deep, probing basslines and the Naim drills them all home. At this point, we start to wonder whether we need the additional input from those Active Bass units. The system is so skilled at delivering bass that, when we turn them off, we don’t really miss this feature. In fact, if you’re stuck in traffic and desperate for the loo, those vibrations are the last thing you need. Play Royal Blood’s Out Of The Black and the system laps up the robust, energetic drumming – at the end of the track we’re left breathless by the punchy and powerful performance. Adele’s Skyfall is equally rousing, grabbing our attention with the dynamic shifts of individual piano strokes. The Naim does a good job of communicating the subtle nuances and pauses in a way that other systems can’t quite manage. The integration between all the various speakers is top notch, which helps create a gapless and immersive sound field as the track flowers into life. And you don’t need to be watching the movie to get a sense of the drama. The system delivers a strong performance across the board, exploding with the track’s dramatic big-band ending. But the Naim system doesn't revel only in the large scale stuff, it captures subtle butterfly beats that run through Umi Copper’s All. The pitter patter of drums and the gently meandering strings are all beautifully arranged and intertwined. The instruments and main vocal are beautifully layered. But all too soon, our testing session is over, and we have a hard time dragging ourselves out of the GT, such is our desire to line up yet another playlist. Nobody does luxury quite like Bentley. And on this evidence, nobody does luxury in-car audio quite like Naim. This isn’t a cheap system, but small change for those able to afford a £200,000 car such as the Bentley Continental GT. This is easily one of the most rounded and expressive in-car systems we’ve ever heard.